We've reviewed our share of Adesso products over the last several months and while we've thought they all were good enough products in their own right however we had yet to find one that stood out head and shoulders above anything else we've reviewed. Well that all changed when Adesso sent us the Adesso WKB-4200UB. A few weeks ago this little beauty showed up at our door and almost immediately took over as our every day keyboard. For starters the new keyboard is sleek and stylish. It features a black and grey design, which fittingly reminded me right away of the Oakland Raiders (no I'm not a fan). Gone is the center placement of the trackpad, which was one of the issues we had with the WKB-4000UB we previously reviewed. As you can see from the images the numeric keypad is gone, replaced by a very functional, very well placed trackpad. 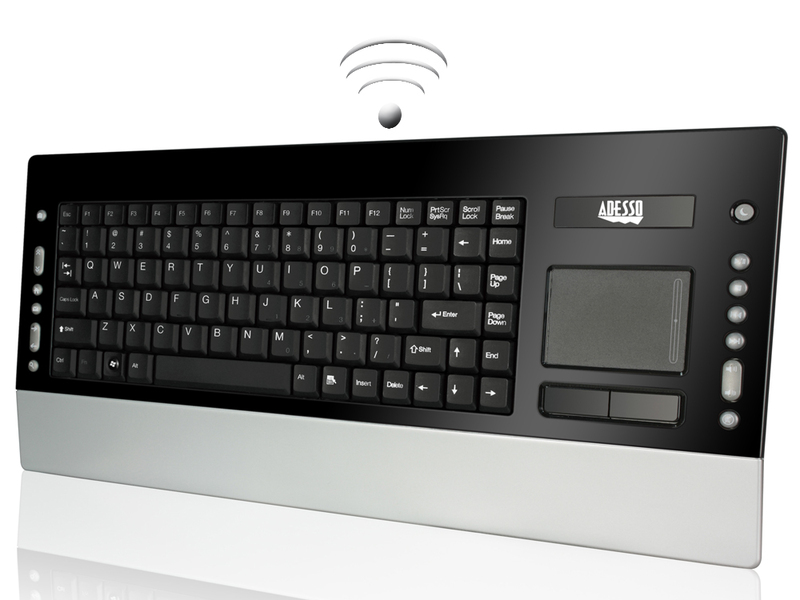 The trackpad along with the new hotkeys and media keys make this keyboard ideal for use in a media center, or office presentation type environment, yet the size and layout make it suitable for everyday use. When used for everyday things like browsing, document writing, blog posting emails ect. the trackpad is very convenient. The right hand placement is aligned almost perfectly with the position held by a normal users mouse. Touch sensitivity is very responsive and not overly assertive. For more advanced use such as gaming or apps that need a more precise faster mouse response you'll be disappointed. The response just isn't up to par in that area. Tactile response on all the keys is fairly good. The keys are a bit noisier than I'd like and are a little firmer what I'm accustom to. Being a slim keyboard they keys are a bit smaller than normal and some are a bit cramped, but nothing that can't be overcome by a few weeks adjustment. Integrating the numeric keys into the right side of the keyboard adds a little more functionality for a kiosk environment but seems to serve little purpose for any daily needs. You'll find yourself either forgetting to switch off/on the num lock or not using then at all. I'll admit the $100 price tag we found the WKB-4200UB listed for at Newegg seems a bit high, especially when you take into consideration the fact most people are going to want to add on a decent wireless mouse. I'd like to have seen Adesso packaged it with at the very least a generic three button wireless mouse for when I'm gaming or just plain get tired of using the trackpad. But when compared to other offerings out there in terms of size, functionality and features it's really hard to beat. 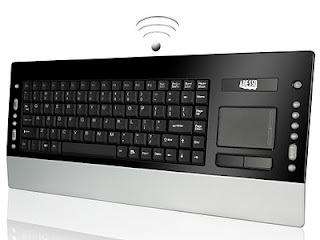 From what I've seen on the market you just can't find a 2.4ghz slim wireless keyboard out there with both a trackpad and full sets of both media and hot keys. For what I'd use it for, which would mainly be a media center PC, I think the Adesso WKB-4200UB might just be perfect. You get a size and shape that easily fits on your lap, or a sleek stylish keyboard that would show nicely on the coffee table.